When adding a flow or report to the Workflow Catalog to run as a service, user permissions to access that entity can be based on the permissions set in the entity's folder. Access to the services in a Workflow Catalog category can also be restricted to individual users and groups by securing all services in the category. For example, a user registers a flow in the Workflow Catalog. The folder permissions for the flow's folder allow only the administrator to use the flow, so the flow will not display for any other user in the Workflow Catalog. To secure the services in a Workflow Catalog category, select the category and in its Actions	menu, select Manage > Manage Permissions	. 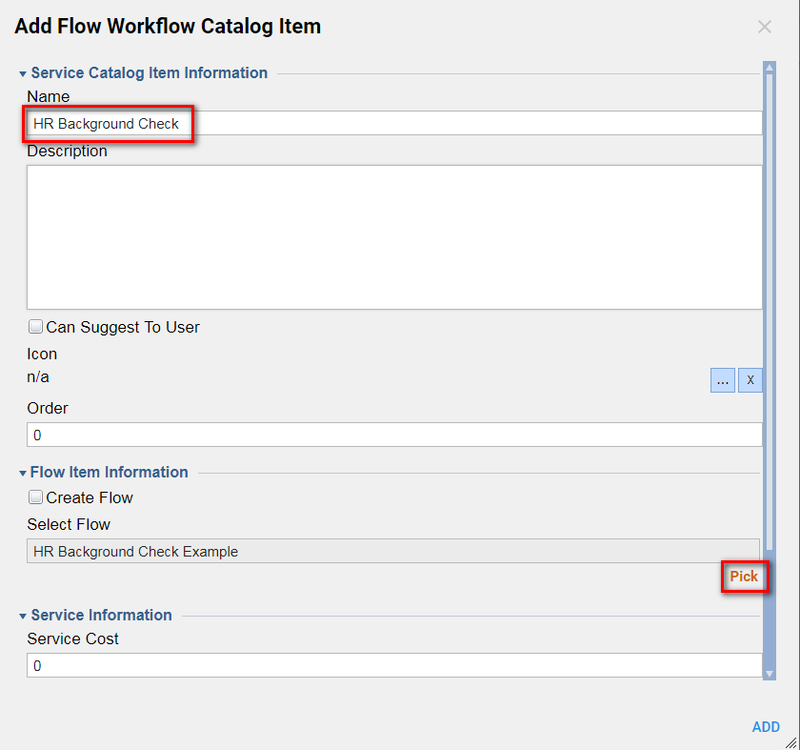 Log in as an administrator and register an "HR Background Check" flow in the Workflow Catalog. Log in as underwriter@decisions.com who does not have access to the flow. 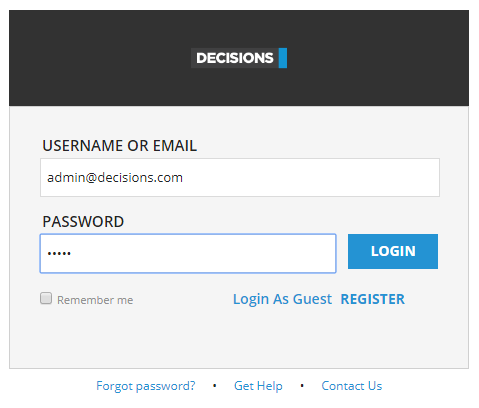 Log in as the administrator and update permissions for the Service Catalog category so that underwriter@decisions.com can access the flow. Log in as unedrwriter@decisions.com and access the flow. 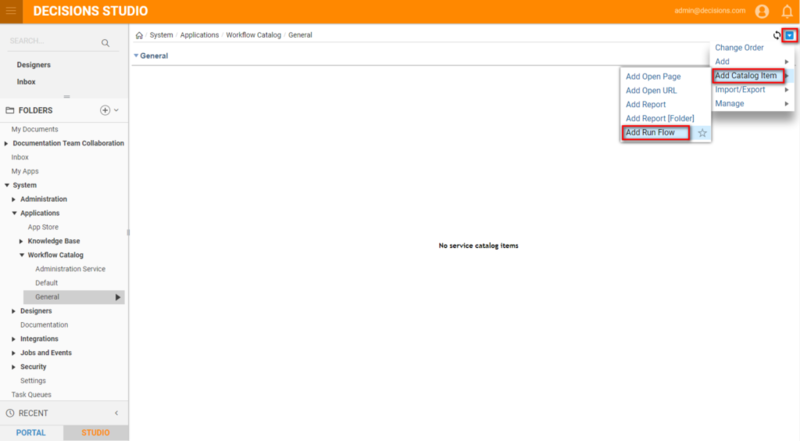 Logged in as an administrator, begin in the folder Workflow	Catalog > General	. From the Actions	menu in the upper right, select Add Catalog Item > Add Run Flow	. In the resulting pop-up, enter "HR Background Check" in the Name	field, and select the flow in the Select Flow	drop-down list. Log out as an administrator, and log in as a non-administrator user, for example, nancy@mycompany.com. Navigate to the folder Workflow Catalog. The flow HR Background Check	does not display. Log out of the portal, and log back in as the administrator. Navigate to the Workflow Catalog category, and selectManage > Manage Permissions	from the Actions	menu in the upper right, or from the actions menu on the folder. 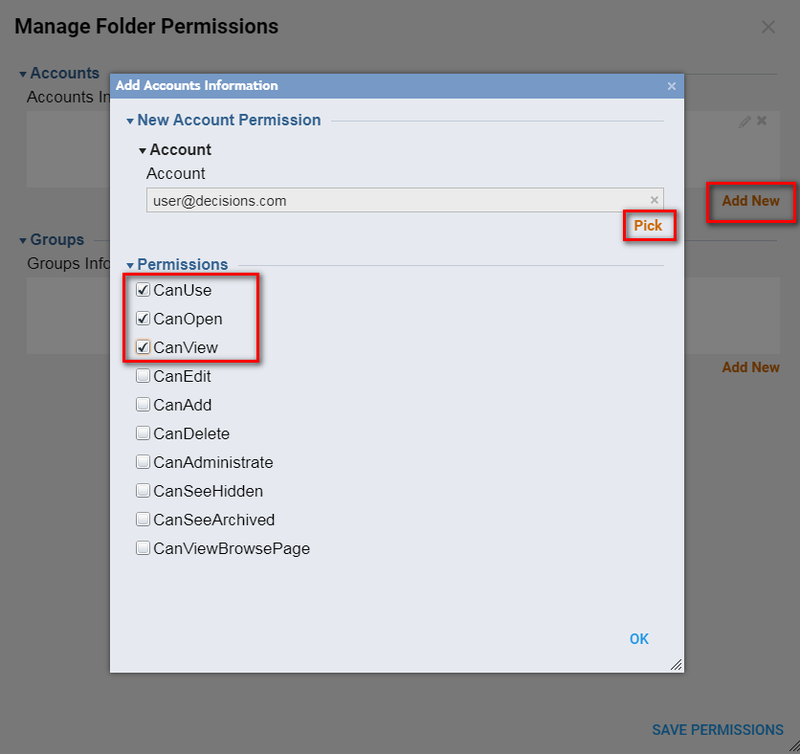 In the Manage Folder Permission popup, in the Accounts Information	section, click the Add New	button. In the Edit Object popup, click the Account	selector. In the Select Account popup, select the account and click OK	. In the Edit Objects popup, in the Permissions	section, select the indicating the permissions the user should have and click OK	.
Click in the Manage Folder Permissions pop-up, we also click OK	.
Log out as the administrator, and log in as underwriter@decisions.com. 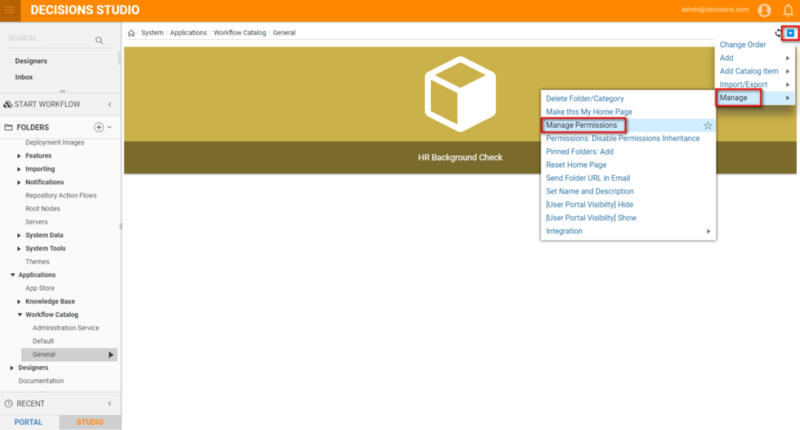 Navigate to the Service Catalog folder, and the HR Background Check flow displays.